The Coalition Advanced Guard and 1st Column advance on Telnitz, their orders objective. Davout's III Corps has Defend orders. This first game I'm playing of Rising Eagles is very much a learning game. Entering the 8AM turn I'm trying out some combat for the first time - and learning an important lesson! Davout has the first activation of the turn. Both halves of the 3 Ligne fire during Davout's Offensive Fire Phase, one missing and the other prompting a Quality Factor Test (QFT) that the defending cavalry passes. The hexes are marked with fired markers. Later, Keinmayer's Advanced Guard activates. 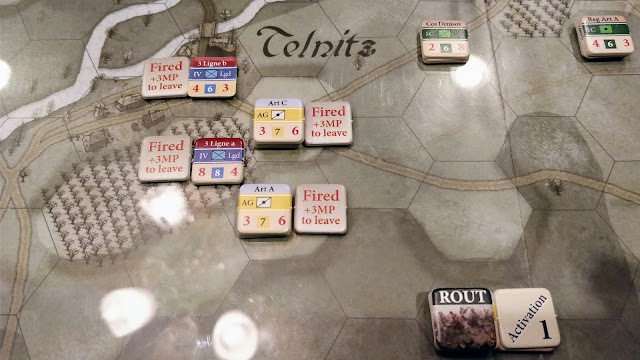 The horse artillery on and near the hill south of Telnitz fires, causing a step loss to the 3 Ligne counter in the village. The Austrians win the exchange of fire this hour. In this system, it's possible to stack up to thirty size points in a single hex. Having greater numbers yields significant advantages in melee combat. The stack under Kienmayer contains all of the infantry in his AG formation, for a total of 27 size points. This gives the Austrians a 3:1 advantage in size, yielding a -3 DRM for any melee combat versus the single 8 strength French unit. I move Kienmayer and the infantry stack adjacent to the 3 Ligne counter in the orchard at the top of the hill. I'm mostly concerned about an attack up a slope versus a full strength unit in an orchard. The attack upslope means a +1 DRM, for a final melee attack DRM of -2 (lower numbers are better for a die roll in this system). I'm thinking the Austrians still have a good shot at clearing the woods, probably forcing the French unit back and maybe causing a step loss. Before the melee attack, though, the 3 Ligne gets a Defensive Fire phase. Unlike during the earlier Offensive Fire Phase, this time the French score a hit and cause a QFT. 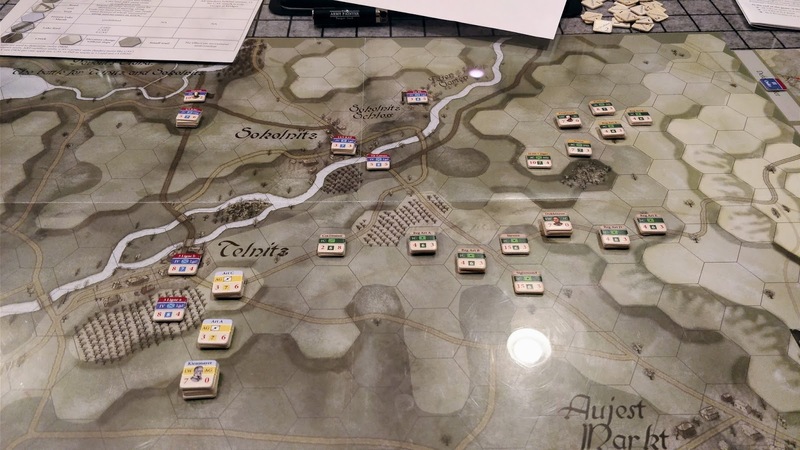 The lead Austrian unit has a Quality Factor of 7, and the Austrians roll a 10 - they needed to roll a 7 or less for the defensive fire to have no effect. Here's where the lesson comes in: had the Austrians missed their QFT by 2 or less, the stack would have had to retreat one hex, or the lead unit could have taken a step loss, the stack would have stayed in place, and the melee attack could continue. So, the Austrian infantry would have been either driven back by the murderous French fire from the orchard, or the staunch Grenzers would take some casualties and continue to press their attack home, though at less of an advantage since the overall size of the attacking stack would have been smaller. The Austrians missed by three, though. In that case, the lead unit immediately routs, and all of the other units in the stack rout with it, moving three hexes away, toward the Austrian LOC. The stack will continue to rout each turn until rallied. So, with a single defensive fire phase, the 3 Ligne stripped the Coalition AG of all of its infantry for at least a turn. We're in turn 2 of a five-turn scenario. That's going to hurt the Austrians. Lesson learned: stacks of doom may not be the best idea! I could have spread out the AG's infantry into two or three hexes and still combined them for a melee attack. French defensive fire would have been confined to a single hex, and even with similar results, far fewer Austrian units would have been caught in the rout. 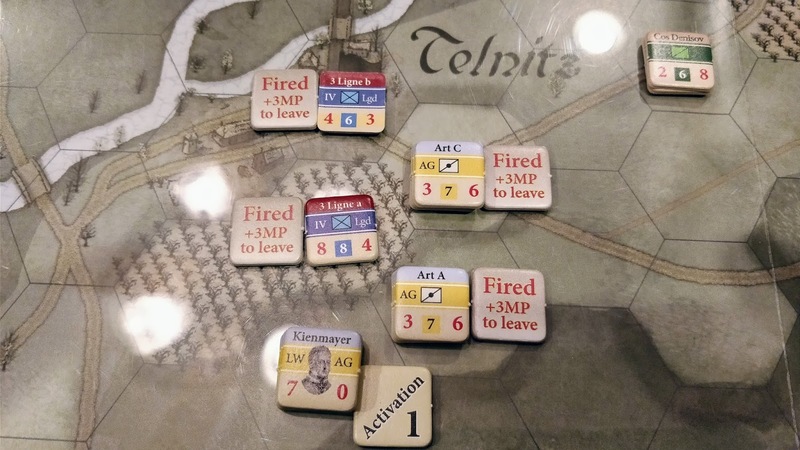 Now Davout has a second activation and reinforcements on the way this turn to shore up the defense of Telnitz, and the AG has no infantry available.